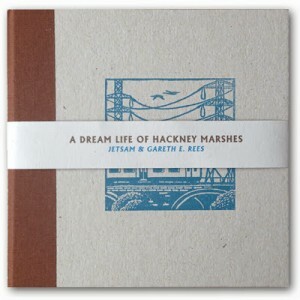 A Dream Life of Hackney Marshes | Unofficial Britain. Walthamstow-based group Jetsam are a contemporary ensemble who create and perform original and commissioned works as well as contemporary repertoire. In 2012 they teamed up with author Gareth E. Rees for a collaborative project inspired by his writing about East London’s marshes. In Rees’s work, the Lea Marshes are a fragmented world which disrupt the walker’s sense of linear time. The landscape is an unsettling mix of ancient wetland, overgrown Victorian ruins, wild flower meadows, pylons, railway sidings and reservoirs. Kestrels hover over grazing rare breed cattle as shopping trolleys are sucked into the river bank. A Dream Life of Hackney Marshes combines local history, folklore and weird fiction with Jetsam’s atmospheric orchestration and unique blend of acoustic and electronic sound, taking you on a journey through this troubled dreamscape. Between 2012 and 2013, A Dream Life of Hackney Marshes was performed to enthusiastic audiences in venues across East London, including The Union Chapel, The Vortex Jazz Café, The Bishopsgate Institute (supporting Hilary Hahn and Hauschka) and Ye Olde Rose and Crown in Walthamstow. The album was released in November 2013 on Clay Pipe Music in a Risograph printed handmade CD case, designed by illustrator Frances Castle. All copies sold out within three weeks.